Eight riders set out for Tideswell by a different route than normal. We set out along Abbey Green and Meerbrook and up to Roach End and the epic climb which raised a few eyebrows not to mention heart rates. We took on the steeper climb in to Flash as ride leader Sean was determined to make us suffer. We were glad to get on to the long, downhill stretch along Axe Edge in to Buxton where we made a few detours to avoid the long traffic ques caused by road works. We were soon on our way past Tunstead and in to Millers Dale and in to Tideswell to arrive a the H a D Bistro where riders were soon enjoying coffee and breakfast. Dave M taking on board extra calories with cake and beans on toast. It soon turned in to a competion to claim the breakfasts as they arrived from the kitchen and there was a few mistaken claims to other riders orders but we managed to sort it out. There was talk of two groups going back by a direct route and a longer route but we all followed the direct route to avoid argument. We headed back in to Millers Dale and up the long climb up to Taddington and in to Monyash and up to Parsley Hay before reaching Long Dale and heading in to Hartington and Hulme End. It was a tough climb up to Warslow as we had a head wind all the way but Sean managed to take the lead. In Warlsow, it was decided to split as one group wanted to shelter from the wind by taking the route up Elkstones Bank while the other group wanted to go the direct route up out of Warslow and to the Mermaid. Myself and Sean and Dave M and Rob B took on the fearsome Elkstone Bank as we told the other group we would beat them to the Mermaid and we did! We carried on in to Thorncliffe and arrived back in Leek at 2.10PM after a fifty one mile ride. Thanks to Sean M for leading the ride and for putting up with our constant mockery of his navigation issues with his Garmin. If only he could lead us out of the Brexit mess so well! Due to our mockery we have been told Sean will be sending us to his newly opened “Re-Education camp” on Blackshaw Moor, “Butlins with barbed wire fencing ” is how he described it, he is too kind to us! Nick A, Leeks King Of Obsolete. 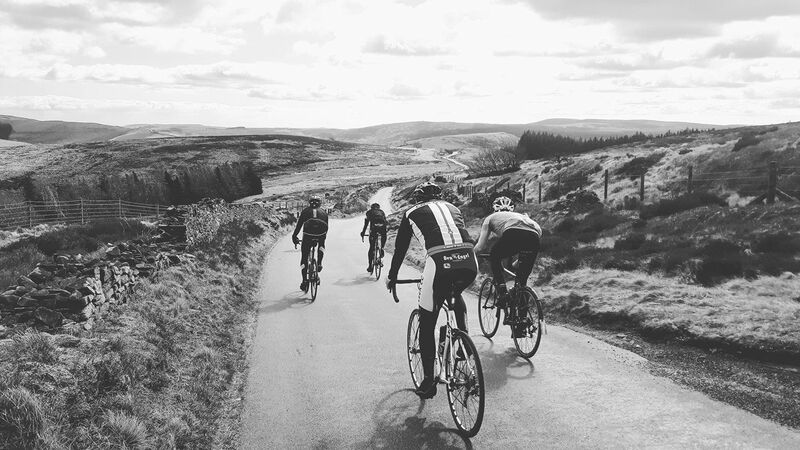 Above is a photo from the 8am ride, they enjoyed a sunny ride over to Bollington and then returned to Leek via Kettleshulme and the Goyt Valley.